Glorious Munkebu. 2 years after hiking to the scenic and popular Munkebu, I was finally back again. 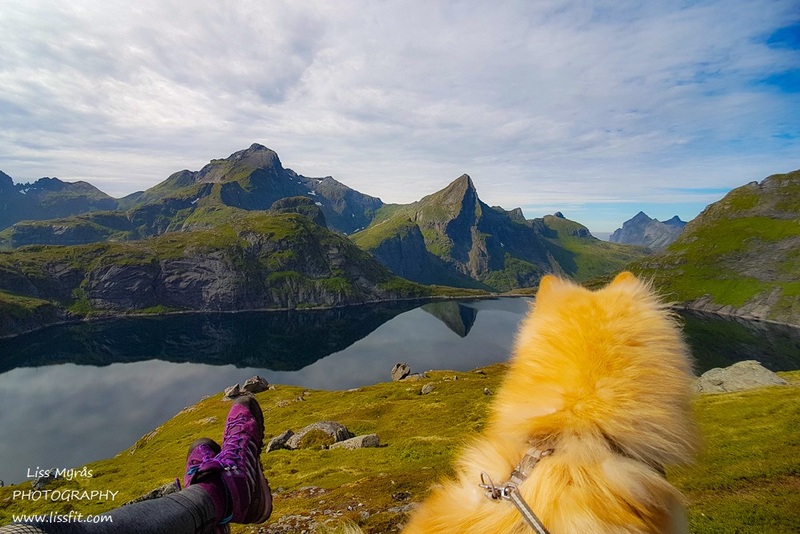 The views are as lovely as ever, and this time I shared this beautiful hike together with my dear puppy. This summer we live pretty close to the trail’s starting point, so it was a natural thing to trek it again. On our way up we came close up to a grouse momma running around protecting her little kids, so I am really glad I kept my puppy on a leash during the hike, keeping in mind that in certain periods lots of birds are hatching. The only time I let puppy free was up at the Munkebu cabins, where we met a supercute Husky puppy my Jenta was running around and playing with by the pond. Hike for who: All in all this is a great hike with really nice views where you pass the lakes at various stages upwards. Perhaps a bit long for some depending on fitness (2-2,5 hours one way), but still an easy/moderate dog- and family-friendly trail most people can do, don’t let the chained section scare you as it is safe and not too steep – the chains are there to make it easier for you. Alternatives: From Munkebu you can also continue up to Munken mountain peak nearby for extra views. 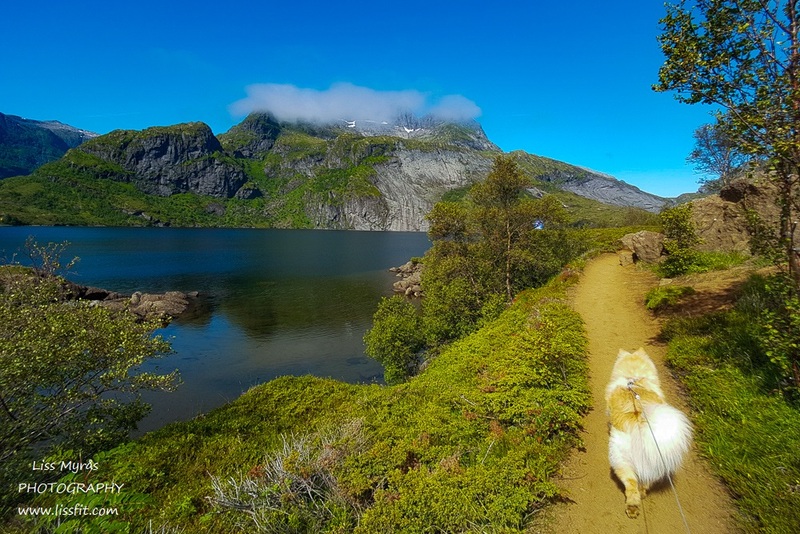 You can also pitch your tent around Munkebu (or around Sørvågen lake) and do the hike to Hermandalstinden ….or why not pay Merraflestinden a visit on the return, (my favorite as you can hike along the steep edge upwards (offers a more gentle descend joining the main trail again). Trail quality: Nice, well-worn and marked. The only thing I don’t like is that darn “mud bath” area you will have to cross along the trail, especially during a moist summer … an trail-cluster over-developed by thousands of hiking shoes and moist). 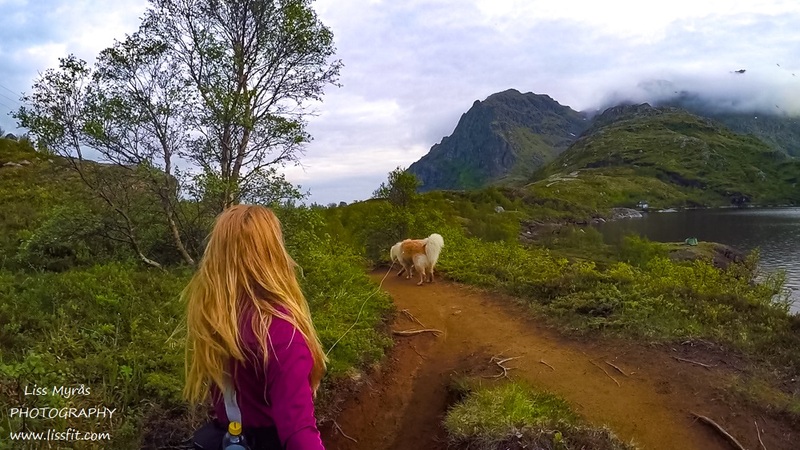 We also met several super nice hikers on this hike (on most hikes we do actually) that we also meet again later .. the Norwegian landscapes are for sure a natural people connector – if you are open for it. Stay overnight: If you plan to stay at Munkebu cabin (or any DNT-cabin in Lofoten) you will need to ask for a “special key“. Personally I still don’t understand why the ordinary DNT-key is not good enough (as a paying member) – the allround-key is suppose to make hikes easier! Not all of us have our a car here to get around picking up special keyes here and there. 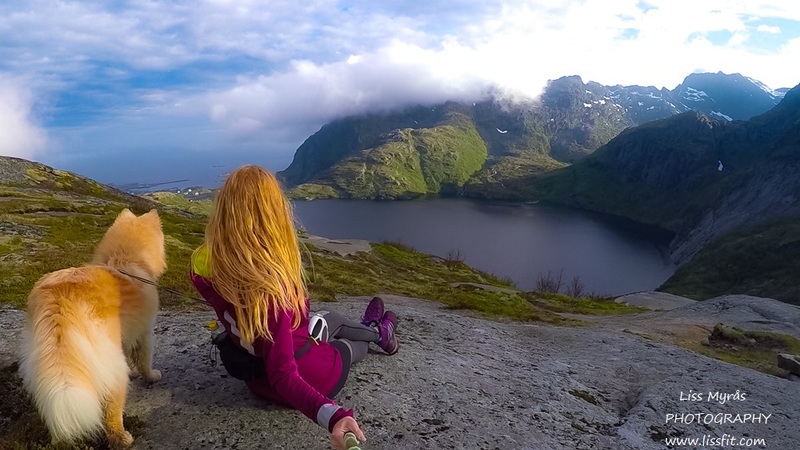 So most people instead pitch a tent around Sørvågvatnet lake or around the area of Munkebu. In good weather it is a blessing for sure, in bad weather a curse. Water filling: I usually fill my and puppys bottle in Studalsvatnet lake or by the ascent at the smaller streams coming from the little pond Kjølavatna (further below Klokkafemskaret). Where to park: When you have passed both the food shops in Sørvågen (coming from Reine/Moskenes ferry) you turn right at the hiking sign/mailboxes, the road will lead you to the parking area with an information board at trail start. Simply beautiful! 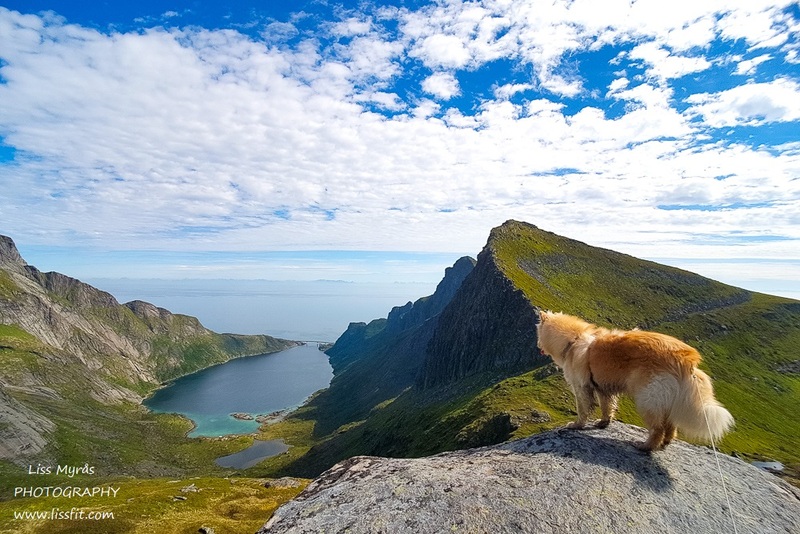 And your sweet puppy complements the scenery so well!